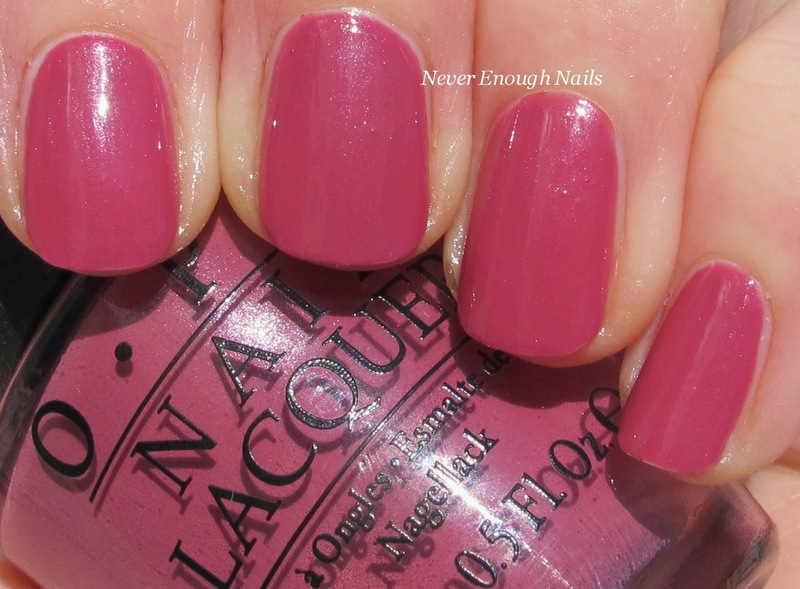 Never Enough Nails: OPI Hawaii Spring/Summer 2015 Swatches- Ladylike Dots! OPI Hawaii Spring/Summer 2015 Swatches- Ladylike Dots! I have three more of the lovely OPI Hawaii polishes for you today. I'm really enjoying spending a little more time with this collection. Sometimes I feel like some great polishes get a little lost in the massive whole collection swatch posts. This way, we can get to know some of these gems a little better. Like OPI Do You Take Lei Away?, for example. Do You Take Lei Away? is a creamy pale beige. This seems to be very neutral in tone, not too cool, not too warm. I read somewhere that OPI wanted to make this sort of color in a shade that would flatter a wide variety of skin tones and I think they succeeded with this one. It looks great on me and I think it will also look stunning on darker skin tones as well. This is three thin coats of Do You Take Lei Away?. If you tend towards thicker coats, two should be just fine. This pretty well pigmented and despite the pale shade, I didn't have any problems with streaking. It has a great consistency and was easy to apply. OPI Suzi Shops and Island Hops is a pale whitened bubblegum pink creme. It's paler and more stark looking than your typical bubblegum pink, but still nicely flattering. I am not a huge pink polish wearer, but I can see myself rocking this quite a few times. If you are more tan than I am, I bet this will look amazing on you! This is three coats of Suzi Shops and Island Hops. I needed a third coat to make it fully opaque and smooth, but two coats might be fine, as it was pretty pigmented. It was pretty easy to apply too, I just made sure I let each coat dry in between, as colors like this can be streaky if you don't. OPI Just Lanai-ing Around is a really pretty mauve-y purple with some hidden shimmer. The shimmer is not in your face, but it kind of adds some depth and shows up the most in bright lighting. The color is an interesting mix of pink and purple. I would maybe call it mauve, but it's not a dusty mauve, it's more like the color of a beautiful Hawaiian flower. I have seen some people call it a grandma shade, and first of all, I hate that term. Grandmas wear a wide variety of colors these days. Second, I find this to be a very fresh looking color, especially against my pale skin tone. I am really loving it a lot and it definitely will get a lot of use here. This is two super easy coats of Just Lanai-ing Around. It's nearly a one-coater, that's how opaque it is! It applies effortlessly. I wasn't expecting this to be a favorite of the collection, but it might just be one! For my fun look for this collection, I decided to dot on some Just Lanai-ing Around and Suzi Shops and Island Hops over Do You Take Lei Away?. It's kind of a ladylike looking dotticure and I love it! These three polishes work really well together for nail art purposes. I can think of several other looks that would be great with these. 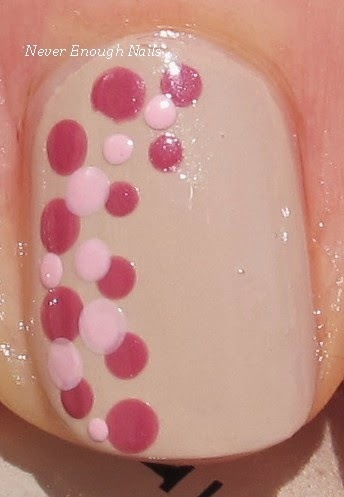 These polishes worked really well for dotting. I used two different sized dotting tools for this look. I'm definitely having fun with this collection so far! It makes me envision myself "lanai-ing" around on a beach instead of shoveling my driveway for the 900th time! Thanks for mentally transporting me to Hawaii, OPI! The OPI Hawaii collection is available now at Ulta, Ulta.com and fine salons. Thanks Ananka! I want to wear the dot mani again, when the weather is a bit warmer!